Review: James Marsh turns his attention to IRA, after two triumphant documentaries (“Man On Wire”, “Project Nim”) and the second part of “Red Riding” trilogy, where he depicted in an exemplary way the corruption of the Yorkshire police. “Shadow Dancer” tells the story of Colette (Andrea Riseborough), a militant of the IRA caught by the MI5 during an operation in London. However, officer Mac (Clive Owen), offers her a deal: to become an informant for MI5 in exchange of freedom and protection for her son. This is a methodic, slow-burning story of espionage that keeps all revelations and surprises for the end, although preserving the sufficient elements needed to keep us alert throughout the time. Betrayals, interrogations, tortures and sly behaviors make part of this cold story of vengeance. 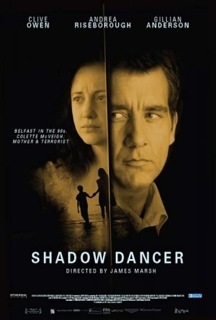 “Shadow Dancer” is not mandatory, but deserves some attention as a solid, competent and adult movie.